Curious as to why these latest postings are dated 2/20? Would be nice if iWindsurf Forum correctly noted posting times/dates? Have you set the local time in your Profile? PST is GMT - 8 hours. How do you get to local profile? I get to settings and there is no selection for this. On this page where you are reading post, up at top above "Where we sailed" are links: Search : Profile: etc. No worries, took me about 10 years to stumble across this. And don't forget to change to PDT (GMT -7 hours) when the time comes. Never knew. I think the rest of you can probably survive should I forget to account for daylight savings! I know y'all wait for my posts with baited breath and pour over every word looking for divine enlightenment! to publish day an time as it always seems to be a the next day. For instance now its 12:48 pm maybe it needs to be minus. Yup -8 seems to do it. First time to launch from Kincaid's Restaurant in Burlingame. Climb down the rip-rap was not too bad and less muddy than Embassy and more water than Coyote at low tide at 2 pm. Went 5.0 which was barely enough but was fine once I sailed above the airport where the wind was 20 mph. Will add this spot to my list giving me 13 places to sail from this season . As the saying goes "variety is the spice of life"
Hard lesson learned at the Stick this Sunday..don't foil at the Stick at extreme low tide. Water level was the lowest I've seen at Candlestick and Robert warned me about the depth. I sailed out anyway and was fine as the foil was up until a big gust caused the board to cavitate and go down close to Sierra Point. I was stuck in mud for a half hour trying to find enough water to sail the foil out..unreal. Eventually found deep enough water to sail out but then the wind picked up to 20 with gusts and I was overpowered on my 5.9 Volt. I limped back to shore humbled. Hei Bert, we were worried about you. From the shore it looked pretty bad, all the way out and you were falling in repeatedly!!!! We were glad when you made it to shore. On other less exciting news. Only 4 times out in 2018 (2 stick 1 Coyote. 1 Crissy). MTB is keeping me a bit away ... Yesterday, at Sick (Bert, Robert and Bob showed up), out with the new Loft Switchblade 7.3. I was already familiar with a, borrowed, 6.8, and I just love this sail. Powerful, fast, solid as a rock, feels light in the jibes and cams rotate in a blink. 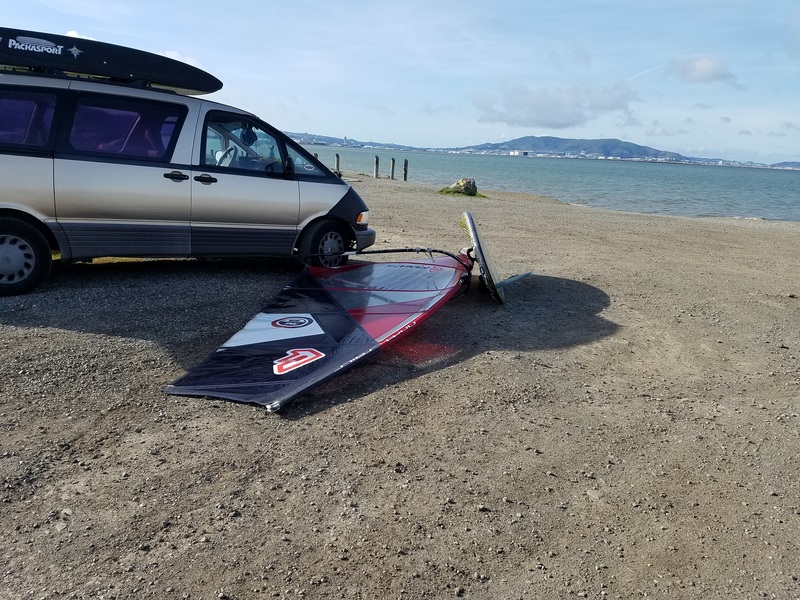 Today it worked like a charm on my Isonic 110, high speed slalom in complete control, woderful runs all the way to Sierra Point it is the perfect low wind size at my 158 pounds weight.